A terrified man, long past the breaking point of sanity. Pushed over the edge by something no one else can see. Staring out a rain splattered window, 20,000 feet above the Earth. Even before the rest of us got a good look at the figure moving across the wing, it was the face of this petrified passenger that scared me so deeply. His fear was infectious. Because of it, The Twilight Zone was a title I would avoid for years to come. The earliest memory I have of legendary cultural icon, The Twilight Zone, was not the TV series. It was the ill-fated 1983 film. Specifically the final segment, Nightmare at 20,000 feet. 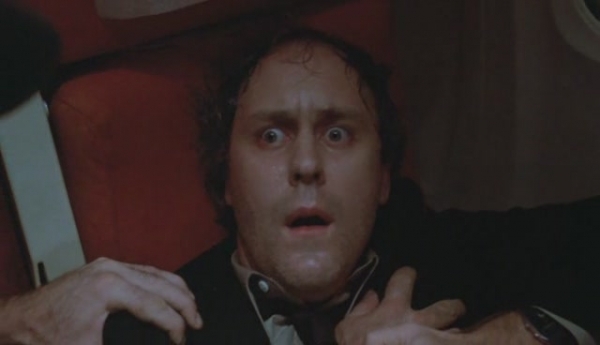 While most people have fond memories of the suited man smoking a cigarette, guiding them through a world of both shadow and substance, at the mention of The Twilight Zone, I see John Lithgow. It wouldn’t be until many years later that I would take another look at the beloved television series that inspired generations of artists. In some ways The Twilight Zone was as common as Disney. No one really remembers ever learning what Disney is, it has always been a part of their lives since childhood. Even before my first viewing of the film I knew of the show. Although I don’t recall ever seeing it. The truth is I’m not sure when I finally did sit down and watch an episode for the first time. However I vividly recall the moment it hit me that this guy, Rod Serling, lived in my home town of Binghamton, New York, and how big a deal that was. Well, I say vividly, maybe I should really be saying relatively clearly. I remember it was in the Helen Foley Theater at Binghamton High School. My impression is that it was some time during my freshman year. We had an assembly where the faculty gave us all a bit of a history lesson regarding the school. Almost all of it faded from my memory. Obviously the moment that sticks out is learning that the Twilight Zone guy (not John Lithgow) graduated from here. They read off a list of his credits, The Kraft Theatre, Patterns, The Twilight Zone, Requiem for a Heavyweight, Night Gallery, Planet of the Apes, and others. They also listed off the insane number of awards he’s won. I remember walking out of that assembly having a new respect for the city I had painted with all the angry colors of teenage angst. Some time later I chased down a friend of mine. Like me he was hoping to be a writer. The two of us had even collaborated on a truly terrible novel that we quickly forgot about. Where he was headed to I have no idea. I mostly remember the two of us having this discussion in front of the plaque dedicated to Rod Serling in front of the school. “Dude, were you at that assembly?” I asked, huffing and puffing. “Yeah,” he said, sneering. He was a big time sneerer. Where our talk went from there is gone. I do recall standing there crestfallen afterwards. Out of everyone I expected him to be equally impressed by what we’d been told. You see, being a teenager in the once great city of Binghamton can be a hopeless thing. The outside world only exists on TV and movies. Most times you feel like you will never get out. The rest of your life was going to be spent wandering past the abandoned businesses, crumbling buildings, the ghosts of a world that has left it behind. Rod Serling was a guy who had gotten out. He’d survived Binghamton and went on to influence the world. He got people thinking and talking. He pushed the boundaries of entertainment. Challenged those working with him and watching at home to strive for something more. He presented the world’s problems in ways easier to digest. This was an important man in so many ways…and he came from my town. 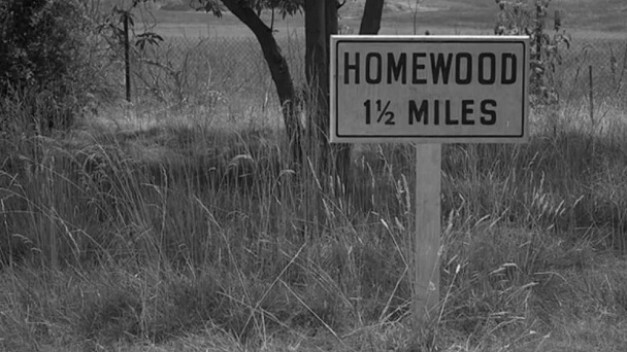 It was a place he would rename as Homewood and write about in the famous Twilight Zone Episode Walking Distance. For me it was very much the way I described above. When you look past the rolling green hills and enter the valley you see the left overs of what was. I often refer to it as a developing ghost town. A dead place that doesn’t know it’s time is up. Afraid to go into the light. This is from the point of view of a bitter alienated slacker who likes to pass the buck. For a long time I blamed this place for my never achieving anything. Had I grown up somewhere with more resources, with a pulse, maybe then I would have made something of myself. Or maybe if I’d grown up there sixty years prior I could share those wonderful memories that Mr. Serling seemed to have. There are times when all this still feels true. Many of the people I grew up with are still there. Some of them are dear friends and doing very well at making lives for themselves. Others appear as wandering corpses. They fade away into the derelict backdrop. A great deal of them have been consumed by their boredom and turned to severe drug use for an escape. They whither away into barely recognizable wisps of the children I once knew. For a long time I used to introduce myself by saying, “I’m from Binghamton. That’s where Rod Serling grew up. 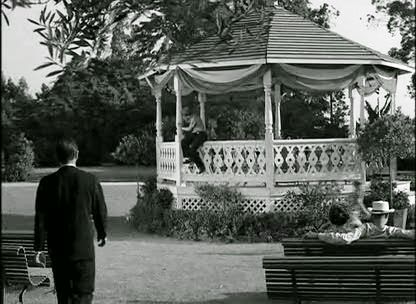 And you can tell where he got the idea for The Twilight Zone. Sometimes you walk around and just think, Something isn’t right here.” I joke that I grew up in The Twilight Zone. 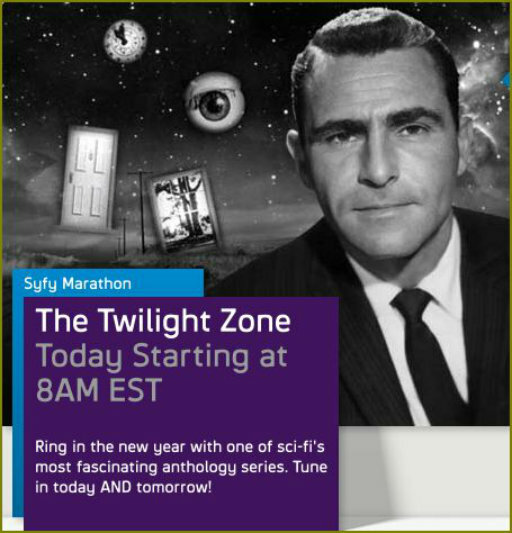 Every New Year’s on SyFy they have a 24hour marathon of The Twilight Zone. In 2005, about to be 2006, a group of friends and I had nothing to do. We were all community college students with no clear paths ahead of us, in a town that seemed to offer no opportunities for the disillusioned. After wasting most of the night trying to find a party (and a particularly hilarious incident at the one party we found that I’ll have to tell you about another time) we settled down in front of the TV. Only myself and my friend Jim stayed watching the SyFy marathon. Everyone else played games or something. We got to talking about the show and Rod Serling and Binghamton. His grandparents actually claimed to know Mr. Serling back when he was called Roddy. Not only that but he currently lives around the corner from what used to be the Serling home. 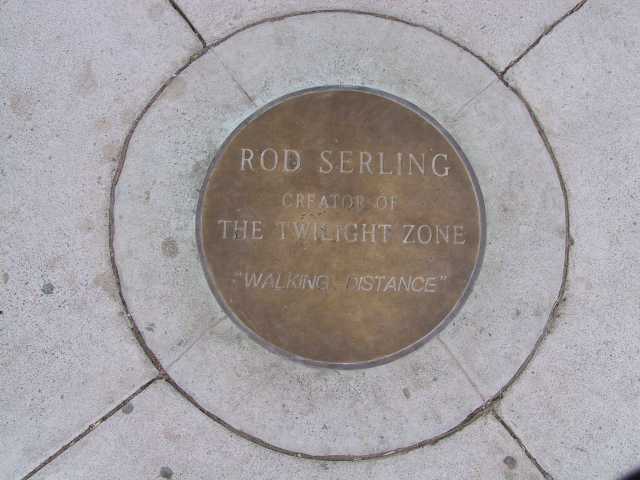 He was every bit as proud of Serling’s connection to Binghamton as I was. This was the first conversation I’d had about it since that failed attempt 5 or so years ago. This was also the first time I REALLY watched the show. As I said before, I can’t remember the first time I’d seen it. This was my first time paying attention, seeing its depth and listening to its commentary. Every year since then I have tried to watch that same marathon. Years passed. I moved away from Binghamton. Spent years in Buffalo that had changed me. Ran into some personal issues that made me nostalgic for my home town. Moved back. My first few months back I was miserable. The last few years were a dream that became a nightmare. So much personal growth had occurred. All of which was stripped away by retreading old steps. Or so it seemed at the time. Here I was back in the town I’d forsaken. Trying to make a better life for myself and falling back into old patterns. In October of that year a few things happened that still affect me to this day. The one moment that pertains to this article is the TZ @ 50 celebration. Half a century ago television history was made and Binghamton was going to celebrate. There was a three day event. 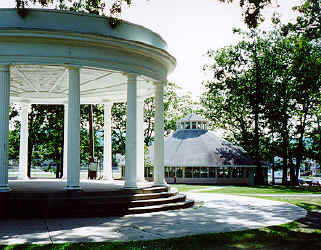 A tour of Binghamton locations related to the series. 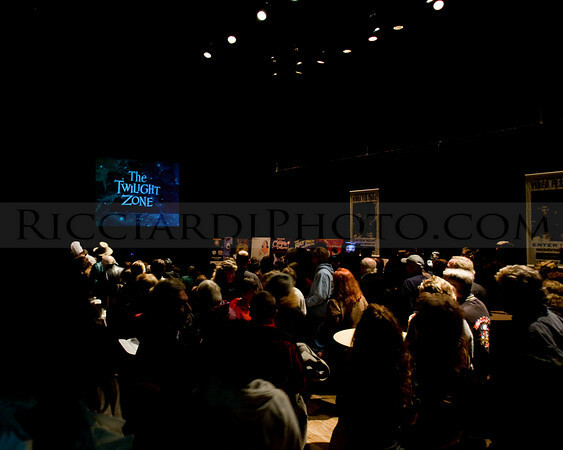 A Night Gallery at the Forum Theatre featuring a screening of the pilot episode of The Twilight Zone – Where is Everybody. WSKG was going to run a live performance of both Mirror Image and Walking Distance. Sunday had an all day marathon of episodes, again at the Forum. I attended the Night Gallery. I loved it. My friends and I stayed long enough to watch the episode a few times. There was something mesmerizing about sitting amongst all those people, with fan art hanging on the walls, and watching a great piece of television projected on the wall. 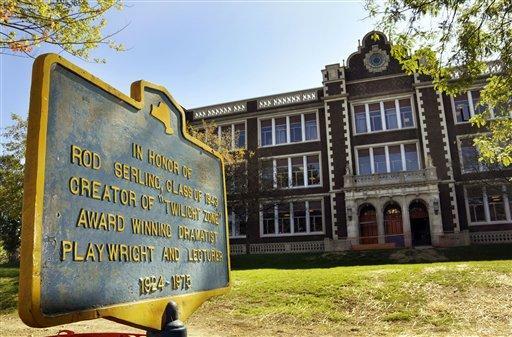 Before they regrouped to perform Walking Distance there was a short documentary about Rod Serling and his Connection with Binghamton. This is what knocked me over. I heard childhood friends discussing growing up with Rod. How he fought to retain his integrity as a writer and maintain his vision. There were photos of him in old time Binghamton. It looked like a happy place. Alien to what I had known. During Walking Distance the producers inserted these photos of Binghamton that was. It raised the level of poignancy to heartbreaking heights. Knowing the world Mr. Serling came from, and Martin Sloan’s journey back there, made me long for it as well. I hoped to enter a world I had never known. A place I’d only seen the long dead remnants of. Again I left Binghamton for what I thought would be bigger and better things. Only once have I returned to visit. None of the sickly nostalgic feelings came to me as I had expected them to. Instead I felt an understanding. This was no longer my home. Although I have yet to find my place in the world – I know it isn’t here. Still, I do feel some nostalgia for the past. Not only the Binghamton that Rod Serling grew up in but the one I did as well. Lately I’ve been wondering if I wasn’t in too much of a rush to get out of there. So busy concerning myself with the young man’s hatred of his home, accusing it of ruining my potential, to appreciate what I had. I find myself missing my own Homewood. Alan Moore said in his introduction to Michael Moorecock’s Elric: The Stealer of Souls (Chronicles of the Last Emperor of Melniboné, Vol. 1) that he knew Melnibone, the fallen kingdom of where Elric dwelled. He saw it in the rundown neighborhoods of England where he lived. The great Empire that had conquered the world had fallen. He lived in its tomb. Well, I grew up in The Twilight Zone. It isn’t the Binghamton that the Show’s creator knew, but it is a place which mirrors the dimension of sound, sight, and of mind that he brought to the world. It is a place that I look back to and shudder. I tremble from the wasted years and all that I couldn’t see at the time. It may be a place I can never go back to. But it is a place I can try to understand. Very interesting. I never thought about Rod, or the show in this way. Nice! I’ve got my own Twilight Zone stories (who doesn’t) including my search for a Rod Serling impersonator once. I used to watch the marathons when I was younger as well. I still try to catch a part of them when possible. It’s amazing how they can still hold up all these years later. Rod most definitely was one of the lucky ones who left before the collapse. That being said, I wish I could remember as much about high school as you. Yes, Binghamton was a terrible place to grow up. Still is at this point; but it’s getting better. Money is flowing in from the colleges and people are moving back in order to find a quiet city in the middle of nowhere (both the “desirables” and “undesirables,” that is, the druggies who can no longer afford to live in NYC and the intellectuals who can no longer afford to live in NYC). Several new restaurants, galleries, breweries, etc., have started to spring up and repairs are being made to the numerous dilapidated structures. Do I believe it will ever get back to the way it used to be? Certainly not. There are far too many people who are looking to make a quick dollar that control far too much real estate. Do I think will see a significant difference in our lifetimes? It would seem so.